Species - Carbonado - Earth Mined. Black Diamonds are of Carbonado variety. Carbonado, commonly known as the "Black Diamond", is the toughest form of natural diamond. It is found primarily in alluvial deposits in the Central Africa Republic and in Brazil Its natural color is Black or dark Grey, and it is more porous than other diamonds. WOW WOW WOW. WOW THIS IS A VERY RARE OPPORTUNITY. Amazing Raw Colour. This NECKLACE Is Hand Picked. BEAD Sizes-. IT IS READY TO ADD TO YOU CHOICE OF GOLD OR PLATINUM DIAMOND SETTING TO MAKE A RARE 1 OF A KIND HIGH CLASS JEWELRY PIECE OR AS IT IS. RUBY GEMSTONE PENDANT. Gemstone - Ruby. This is a very elegant Ruby gemstone pendant. 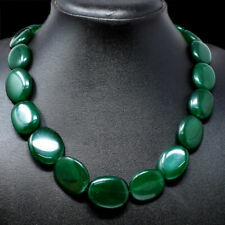 The gemstone has excellent cut and luster. Clasp & Chain - 925 Sterling Silver In white finish. Main Stone Ruby. Christmas Offer 5 mm Rough Black Diamond Beads Necklace in 925 Silver 18-19"
Species - Carbonado - Earth Mined. This is an elegant Black Diamonds necklace with Free matching earrings. The Diamonds are with Excellent cut and the facets catch the light brilliantly and have magnificent Sparkle and Luster. Pendant Material: White mabe pearl(13mm). Material Mabe pearl. Pearl Type Mabe. Silver Type: 925 Sterling Silver. Pendant Size: 54x20mm(2 1/8x13/16")w/bail. Pendant Weight: ~4grams. Style Pendant. Color White. Silver Type: 925 Sterling Silver. Pendant Size: 36x12mm(1 3/8x7/16")w/bail. Pendant Weight: ~5grams(0.2oz). Style Pendant. Country of Manufacture Indonesia. Main Color Green. Copper Seraphinite, Emerald Quartz Gemstone Handmade .925 Silver Pendant 1.6"
Pendant Material: Citrine(18x14mm). Main Stone Citrine. Silver Type: 925 Sterling Silver. Pendant Size: 33x15mm(1 5/16x10/16")w/bail. Pendant Weight: ~9grams. Style Pendant. Country of Manufacture Indonesia. Pendant Material: Onyx(11x9mm). Main Stone Onyx. Silver Type: 925 Sterling Silver. Pendant Size: 36x12mm(1 7/16x1/2")w/bail. Pendant Weight: ~5grams. Style Pendant. Main Color Black. Pendant Material: Grey mabe pearl(13x11mm). Material Mabe pearl. Pearl Type Mabe. Silver Type: 925 Sterling Silver. Pendant Size: 52x24mm(2 1/16x15/16")w/bail. Pendant Weight: ~4grams(0.1oz). Style Pendant. We Deals in Jewellery Set. In any case, if you are not satisfied with. We will do our best to resolve any problem and to make you satisfied. we will try to satisfy you by resolving your concern. and we will do everything to satisfy you. National Council of Jewellery Valuers (NCJV). Total weight of pendant: 15.8gr. A quick look at a the short videos of our remarkable products will give you an idea:search for Arianna Gemstones Australia on YouTube. Pendant Material: Onyx(13mm). Main Stone Onyx. Silver Type: 925 Sterling Silver. Pendant Size: 39x16mm(1 9/16x5/8")w/bail. Pendant Weight: ~5grams. Style Pendant. Main Color Black. Pendant Material: Pink mabe pearl(13mm). Material Mabe pearl. Pearl Type Mabe. Silver Type: 925 Sterling Silver. Pendant Size: 51x18mm(2x3/4")w/bail. Pendant Weight: ~4.5grams. Style Pendant. Color Pink.